I recently attended one of John Farnam's rifle classes in Camden, Tennessee and hosted by James Yeager's Tactical Response. As is my habit, I thought I'd post a detailed description along with some of the lessons I took away from the class. I have long known that, in theory, a rifle is a much better defensive tool than a handgun in most situations. As Clint Smith famously said, "The only purpose for a pistol is to fight your way back to the rifle you never should have laid down." Rifles are more powerful, longer ranged, carry more ammunition and easier to shoot accurately than a pistol is. The pistol's only real advantages are its smaller size and weight, making it more concealable and handier in tight quarters. Despite these theoretical advantages, several experiences have led to my pistol remaining my go-to gun for self defense, even when a rifle is available. The first came when I was shooting an El Presidente with my newly purchased rifle two years ago. My first sequence of shots went well, but I completely botched the reload. Later that year, I created a scenario for one of our Utah Polite Society events involving a terrorist attack where the shooter must pick up an unfamiliar rifle and operate it. Again, shooting was generally excellent, but reloading and other gunhandling skills abysmal, even among accomplished pistol shooters. These experiences led me to the conclusion, perhaps obvious, that pistol skills don't translate to the rifle. Whatever the advantages of the rifle, in a self-defense situation I felt I would be better served by a pistol I had the skills and experience to use and the confidence that I could fight with it even under adverse conditions. However, I have also been looking for any opportunity to get some good rifle training and remedy this deficiency. The Utah Polite Society did some rifle drills last summer, but I was only able to attend a few before I move to South Carolina. We did about an hour worth of rifle work in John Farnam's Fighting With a Handgun class last October, but this was only enough to whet my appetite. Given my positive experience with John, I decided to register for this class and come to Tennessee and hopefully fill this gap in my repertoire of fighting skills. One of the great things about this class was that it gave me a chance to put all my rifle gear to a fairly stressful test, letting me learn what works and what doesn't. I shot the class with my Robinson Armament XCR. I recently replaced the EOTech I had on top of it with an Aimpoint Micro on a Larue mount, mounted as far forward on the full length rail as possible. I carried it on a Vickers Combat Applications Sling. A coaxial Streamlight and a vertical foregrip round out the rifle. I brought half a dozen MagPul PMags, and carried them in a Sneakybag. Based on earlier experience, I clipped the Sneakybag to a carabiner on my belt to keep it from swinging around too much. I've found that without some method of securing it, it tends to end up underneath me when going prone. My Glock 21 spent the class in a Comp-Tac C-TAC holster, just as it does for EDC. Since the XCR can digest steel cased ammo without a hiccup, I bought a case of 62 grain Wolf FMJ to shoot for the class. Before coming to the class I put all 1000 rounds on stripper clips. This was a lot of work (it occupied my hands for most of the Super Bowl), but in combination with a Strip LULA loader it let me charge magazines in under thirty seconds. This let me spend a lot less time charging magazines than the other folks in the class. The one flaw in my planning was I didn't bring any loose ammo. Whenever I needed to top off a magazine with less than a full stripper clip of ten rounds, I had to pull individual rounds off a clip. Next time, I'll leave a hundred rounds or so off the strippers for topping off magazines. One of the other students had an XCR and one shot an AR. The other half dozen students shot AKs. About half of them were using loaner guns from Tactical Response, while the others had their own, considerably nicer, rifles. John used his XCR in 7.62x39mm (got to get me one of those), while Frank used his AR and a FAL. There were a couple of other Aimpoint Micros in addition to mine, a pair of EOTechs, and one no-name red dot. The loaner guns all had iron sights. Except for the loaners, all the guns had coaxial flashlights of one sort or another. The vast majority of the class carried Glocks, with only one SIG and one HK bucking the trend. Many of the students had chest rigs or tactical vests of one sort or another, though as the class went on some of these disappeared in favor of stuffing mags into a cargo pocket. The class met at Tactical Response's gear store for some classroom work before heading off to the range. In addition to John Farnam himself, Frank Sharpe, one of his instructors, helped run the class and coach students. We had eight students in the class, many of whom had just finished John's DTI Instructor course the previous two days. John began by explaining the range safety rules. He not only runs a hot range, he's very strict about it. In this class, carrying a pistol or rifle without a full magazine inserted and a round in the chamber will get you a chiding. As John puts it, "empty guns make me nervous". Manual safeties are engaged whenever the rifle is slung, but they come off as soon as you mount the rifle. Once a rifle is in your hands, a manual safety is just an impediment to getting it into action as soon as possible. This makes trigger finger discipline extremely important. The trigger finger needs to be in register except when actually shooting. Trying to carry the rifle around with the manual safety off and a finger on the trigger is an invitation to an ND. Rifles were to be kept muzzle down at all times, unless on the line shooting. This includes not only muzzle down carry and keeping the muzzle down when passing the rifle, but also keeping the muzzle pointed down whenever setting the rifle down or putting it in a rack. Keeping it muzzle down at all times, rather than transitioning from muzzle down carry to a muzzle up rack is one of those, "why the hell didn't I think of that," things. These are not precision rifles with crowns that have to be babied. Every gun has a muzzle brake or flash hider of some sort that isn't going to be hurt by being rested on the ground or set on the floor. Eye and ear protection were required, of course, and John also required the students to wear baseball caps to provide additional protection against flying brass. I seemed to spend most of the class to the right of other people's ejection ports, so I was glad of the protection it provided. The students and instructors generally had excellent safety habits. For the most part, I saw excellent muzzle and trigger finger discipline for the entire class. One student, however, seemed to have some problems keeping the muzzle pointed in a safe direction when his weapon was slung. John and Frank were quite good at jumping on these violations and getting his gun pointed back where it belonged. We were required to have our rifles with us at all times, even when using the port-a-potty, or grabbing a snack. Part of this class is learning how to live with a rifle all the time. If the SHTF and things are bad enough that you need a rifle, that should not be the first time you've tried to carry one all day. We went through field stripping and cleaning procedures in some detail for the AR and AK rifles, and briefly for the XCR and FAL. The differences were quite instructive. The innards of the AK and XCR field strip down to 3-4 parts, all fairly substantial. The FAL has somewhat more parts, particularly since this one was a para model with the double coil buffer spring, but again, all are fairly large. The AR on the other hand, stripped down into many more parts, including two tiny pins. I know which rifles I'd want if I had to take one apart in a muddy ditch somewhere. John also explained and demonstrated the flat stock technique. I mentioned this in my writeup of his class last fall, but since I only had a little experience with it I declined to describe it, particularly since it's the sort of thing that's easy to demonstrate but hard to describe. This time around, I'll bite the bullet and take a whack at it. The flat stock technique replaces the standard low ready. Rather than just keeping the stock on the shoulder and lowering the rifle, you rotate the rifle 90 degrees counterclockwise (for a right handed shooter), slide it back so the stock is lying flat on top of the shoulder, then lower the rifle 30-45 degrees to the standard low ready position. To mount the rifle, swing it up, punch it forward, and rotate it 90 degrees clockwise. For a quick close range shot you can just raise the rifle without rotating it or pushing it forward and fire from the flat stock position. This does a couple of things that low ready doesn't. First, the rotation makes it less likely that you'll swing up too far and overshoot when coming up on target, as often happens coming up from low ready. Second, placing the stock on top of the shoulder shortens up the overall length and provides a bit of a compressed ready, which is an advantage in close quarters. One thing John said that I think was particularly insightful is that "Training takes place when you fail." As those who have read my writeups of other classes or Utah Polite Society events know, I tend to report a lot of mistakes, both mine and other people's. This is quite intentional. I'm not just trying to focus on the negative; every one of these was a learning experience for me. If this course only covered things we were already good at, there wouldn't be much point in coming (aside from masturbating one's ego). Keep this in mind when you read of my, and other students', screwups below. We stopped for a nice lunch at a local barbecue/fried chicken joint called Kody's on the way to the range. Out at the range, we got started by zeroing our rifles. For some of us, this was a somewhat lengthily process. I, for instance, had a brand new Aimpoint which I'd only 'zeroed' by cowitnessing it with my iron sights. One other student was in a similar position. We zeroed to be dead on at 40 meters, which is around the first intersection for those of us shooting .223 rifles. The folks with 7.62x39mm really should have zeroed closer to 30 meters, but a 40 meter zero was close enough, particularly at the ranges we would be shooting. Some of the AK folks had a bit of trouble zeroing with the iron sights, since nobody had brought an AK sight adjustment tool. Those who had a pretty good zero lived with it and those who were off by a bunch improvised using a hammer. Once everyone was confident in their zero, we moved on to some dry fire practice. This was both to get people used to the trigger reset of their rifles, but also to make any flinching problems evident. One shooter would dry fire, while the other ran the bolt manually to reset the trigger. Our first live fire aside from zeroing was the 100 round drill. The goal here is to fire approximately 100 rounds (3x30 round mags or 5x20 round mags), reloading as necessary, and get a nice good grouping on the target. All shooting was done offhand from 40 meters. We were only allowed to fire four rounds from any one spot, then use the flat stock technique to move and glance around before firing another four rounds. This gave us a lot of practice on the trigger reset and mounting and dismounting the gun from the flat stock position, as well as a couple of mag changes. It was also a bit of a torture test for the gun (and shooter). If a gun is going to break in training, it's probably going to be here. My XCR was certainly smoking a bit during the third magazine, but it held up quite well. This drill went fairly well for me, though I noticed that after moving to the right I had a tendency to stop in a more bladed stance than I really wanted. My one big screwup was grabbing an empty magazine from my Sneakybag's dump pouch rather than a full one from the main compartment. Some more reloading practice should help this, as might making sure dumped mags don't end up vertical, in the same position as the full ones. By the end of the drill, my support arm was aching quite a bit, not simply from holding up the rifle and moving it up and down, but from the tension of trying to hold it very steady when shooting (something doing this drill at forty meters probably brought out that doing it at ten wouldn't have). Most other folks did pretty well, though there were some accuracy problems and some magazine issues with one of the AKs. Our next drill set the basic pattern for many of the drills we did for the rest of the day. Seven targets were set up 40 meters downrange. We had to moving down the firing line to the right and stopping engage each target with one shot while avoiding some randomly placed bystanders between us and the targets. At the end of the line, each student did a scan and topped off if necessary. This drill was run one shooter at a time. We happened to have an equal number of .22 caliber (.223 and 5.45x39mm) and .30 (7.62x39mm) shooters, and the holes two calibers make in paper are easily distinguishable, so we were able to run two shooters through the drill before going downrange to score and tape, which sped things up quite a bit. For this first drill, one target was placed at bad breath distance, representing a threatening but unarmed adversary to be engaged with a muzzle strike before shooting the targets downrange. The muzzle strike was interesting, with some folks engaging in a dainty little jab and others punching it more forcefully. Using a rifle as an impact weapon seems like something that needs to be done with gusto, if it is to be done at all. The next drill followed the same pattern, but complicated things considerably. This time, the close up target represented a lethal threat, to be engaged with a shot from the flat stock position before starting to shoot the far targets. In addition, we removed the magazine from the rifle before the drill, forcing a transition to pistol to engage a close up (4 yard) target after taking the first long range shot. After dispatching the second close in target with the pistol we reloaded the rifle and engaged the remaining 40 meter targets. I've seen targets shot up close with pistols, but the effect of rifle velocity gases on a cardboard target was pretty impressive. Each shot blew a three inch hole in the target. The pistol transition suffered from the same drawback that a lot of malfunction type drills do. Since you know they're coming, there's a tendency to make only the most desultory efforts to shoot the target, rather than using good form because you know you'll get a click instead of a bang. Randomly placed dummy rounds or randomly downloaded magazines can take longer to set up, but they provide the real surprise factor a malfunction would cause. Up until this point, all of our drills were shot standing, from the offhand position. That's probably the most likely scenario for police or self-defense use, but there are occasions where more steadiness would be desirable. John had one of the instructors demonstrate double kneeling, kneeling support, opposite knee kneeling, and prone, including rolling over to the right and left while prone. The prone that he demonstrated was quite different from the one I've used before. Rather than splaying the legs out and aligning the body at an angle to the target, John advocated a default prone with the feet together and the body pointing directly at the target. This is a prone designed for use behind a small, potentially narrow piece of cover, rather than a prone designed to give the maximum possible shooting support. I think this makes a lot of sense. If you need more support, you probably have time to splay your legs and realign the body, but if you need to shelter behind a narrow piece of cover, you may not have time to pull in your legs before you get shot if splayed legs are the default. We also went through shoulder to shoulder transitions, and all the shooting positions using the opposite shoulder, as well as supported shooting using a rest. After the demonstrations, we shot from all the positions. John had us run through a series of shoulder to shoulder transitions, to get used to swapping sides with the gun, then had us run through all the positions using support side shoulder. One thing I discovered was that with the Sneakybag carabinered to my belt, shooting rolled over on my left side was pretty uncomfortable. It’s still doable, but maybe a somewhat more flexible attachment, like a short bit of bungee cord, might be useful. Following this, we moved up to about four meters, to try some brain stem shots against a target with a hostage. This followed the same pattern John used in the class I took last October. You ask the target, "What do you want?" to get him thinking about something other than blowing the hostage's brains out, then mount the rifle and put two shots right into his nose. Doing this with a rifle is a lot easier than doing it with a pistol, provided you remember to hold over to compensate for the high sight axis. I totally forgot the hold-over on my first shot and put the round right into the target's jaw. As soon as I pulled the trigger I remembered and moved the dot up onto the forehead and hit him in the nose. We did about a dozen brain stem drills, and aside from the first shot I dropped into the jaw, I ended up with one ragged hole. We pulled back to try headshots from forty meters. John gave us the option to use a supported shot or steadier position to hit the head. I tried both supported and prone. After doing this a couple of times with our own rifles, we started passing rifles to the person on our right, until everyone got a chance to shoot each rifle. It was about this time (right before he passed it to me, actually) that we noticed that one student's Aimpoint Comp M4 was coming loose from his Larue mount. He'd used some loctite on the screws, but one was gone and the other was loose. He pulled the scope off (quite easy with the Larue mount) and used iron sights for the rest of the day. Shooting the other rifles, I found that the AR was noticeably lighter than my XCR, but otherwise shot pretty much the same. The other XCR shot exactly like mine and even had an EOTech on it like mine used to. The AKs with optics shot fairly similarly as well. The iron sighted AKs, on the other hand, were a lot slower at this range. 40 meters is well within the range of an iron sighted rifle, even for headshots, but carefully lining up the sights takes time. Red dot sights are often lauded for their speed at CQB ranges, but that close an iron sighted rifle can be shot very quickly by just superimposing the front sight on the target and ignoring the rear sight (the "caveman EOTech"). Where a red dot really seems to shine is at these somewhat longer ranges, where you need to line up the sights more carefully on an iron sighted rifle, but a red dot just has to be superimposed on the target. After our own rifles got back around to us, the sun had dipped below the hills and it was getting pretty dark. We started the night portion of the class. We talked a bit about flashlight techniques, particularly using a hand held light with a rifle. This was very important for the folks using loaner AKs, which didn't have coaxial flashlights. Doubly so since they didn't have an optic or night sights, so they needed the target well illuminated to make out their sights against it. Those of us with coaxial lights and red dots/night sights had things a lot easier. For our first night drill, John placed a road flare in front of the leftmost target and had us go down the line stopping and shooting each target. We shot the first three using the light of the flare, then engage the last four using our flashlight. Forty meters is a bit of a stretch for a handheld or weapon mounted light, but everyone had good, high power lights and were able to make their shots. Finally, our last drill of the night was what John called the "cruiser drill". His flashlight, a Firstlight Tomahawk, has a neat mode where it flashes blue and red LEDs and the main lamp in sequence; producing a pattern somewhat like a police cruiser's light bar. We had to shoot each of the seven targets using only this flashing light. I found this pretty distracting. In fact, I totally missed with my first two shots, firing at an empty target stand next to the first target. After that I settled down and looked a little closer to get good hits on each target. After the cruiser drill was done it was around 7 o'clock and we retired to a well deserved dinner at a local steakhouse. I have to say I was pretty sore after a day of shooting, dropping down to kneeling and prone and getting up again, and running up to check targets. My right shoulder was particularly sore, not from the modest recoil of my .223 rifle, but from having the weight of my rifle and ammo bag hanging on it all day. The next morning we got things started by verifying the zero of our rifles. I found mine was shooting about three inches to the right, but I don't know if the zero on my Aimpoint actually drifted or if my shooting improved enough that an error I had when I zeroed yesterday became visible (my zeroing groups today were about half what they were yesterday). After initially adjusting the wrong way I got things dialed in. Our first drill of the day involved making a 40 meter torso hit as quickly as possible and following up with a headshot. My quick body shot was perfect, dead center, but the headshot, which I took a lot more time on, was way off. I think I kind of psyched myself out trying to be overly precise. All of our moving and shooting drills from yesterday involved moving from left to right. This is the more comfortable direction for right-handed shooters (no southpaws in this class) and the easiest to keep safe, since it's easy to keep a rifle in the ready position from pointing uprange while moving. However, in a fight you might not be lucky enough need to only move towards the right. To make sure nobody got muzzled, we cleared everyone off from behind the line. John gave us the option of either shooting right handed and crab stepping sideways down the line between shots or shooting off the left shoulder. I chose to transition to the left shoulder after the first shot. If there's one thing Gabe Suarez's classes really drilled into me it's that the only way to move quickly and safely is to point your toes in the direction you're moving. Anything else is just too slow and has too much of a chance of stumbling over something. I found my biggest difficulty shooting of the left shoulder was acquiring the proper cheek weld. I've never had to hunt for the dot in the Aimpoint off the right shoulder unless I was in a weird position. On the left shoulder I had to look around for it a bit. I definitely need a more consistent support side cheek weld. The first time through only one other student and I shot from the left shoulder. John ran us through the drill again and required everyone to shoot from their support side. One thing Frank noticed was that many of us tended not to put the left index finger into register when we should. I know I was guilty of this; my left trigger finger just isn't as well trained as the right. Another sign that I need to do more support side shooting. Our next drill was perhaps the most difficult of the class. We shot the same course, moving to the left, but could only shoot one-handed. Our first six shots were with the primary hand and the last two with the support hand. Keeping the rifle steady while getting a good cheek weld was exceedingly difficult. I actually found it easier shooting one-handed with my support hand, but this may be because I'm normally a lefty, even though I shoot right handed (right eye dominant). I'm sure that some of my right handed shots didn't even hit paper. The last drill involved shooting from cover. We had to fire shots from the left and right sides of a piece of high cover (two stacked 55 gallon drums), each side of a single drum, and prone from each side of an overturned bench. John talked about muzzle masking before the drill, but quite a few folks still had trouble. Oddly enough, more people had trouble shooting around the barrel, where their sights were only slightly further out than their bore, than they did shooting around the bench, where the rifle was rolled over a full 90 degrees. Perhaps they were just more aware of it shooting around the bench. As the rifle portion of the class came to an end, it was time for our rifle test. The test was fairly simple, five targets (approximately IDPA sized) at forty meters, in fifteen seconds. No misses or second shots allowed; five hits in five shots were required. Before the first shot we had to get off the X and sometime between the first and fifth shots we had to move twice more. These subsequent moves could be a couple of steps laterally, or going from standing to kneeling or prone, or kneeling to prone (getting up doesn't count as a move). This seems like a fairly simple test. I suspect by this point in the class most students could just shoot the targets in under 5 seconds if that was all they needed to do. The need to move makes the test deceptively difficult. There's the time required to move, of course, but also the need to get back into shooting mode after a move. Only two folks in the class passed the first time through. It took me until my third go-round. The first two I tried dropping down to kneeling or supported positions, popping up and moving, then going kneeling to prone. Not only did all this getting up and dropping down take too much time, but because I knew I was taking too much time, I rushed some of my shots and ended up missing once on each try. Despite having made similar shots offhand throughout the course, I was nervous about trying to do it when it counted and kept seeking better supported positions. Finally the third time around I just decided that the only way to do this under the time limit would be to stop trying to shoot everything supported, trust in my offhand shooting skills and just shoot it standing with lateral movement. I made it with a second to spare and got good hits on all five targets, passing the test. As other people rotated through I noticed that the successful folks either shot from standing and moved laterally, or stayed in one spot and shot standing, kneeling, prone. Trying to do both vertical and lateral moves inevitably took too long. One student had a particularly bad time on one run. He tried to shoot and got a click instead of a bang. He did the tap-rack-bang drill and got another click. After repeating this three or four more times, he finally listened to the people yelling at him and changed mags. A TRB will fix many malfunctions, but if it doesn't work there's not much sense doing it twice. It's probably either a double feed, or a magazine failure, but in either case, you need to get that mag out of the gun to fix it. In this case it turned out to be a failed magazine spring. After each student passed the test, John presented them with a Defense Training International rifle pin, and they got a round of applause from fellow students. Eventually, all the students except for two had passed the test. After a couple of go-rounds where it was just the two of them, John decided to call a halt and break for lunch. After another fine lunch at Kody's, we went back to the range and started with shotguns. Originally, John was going to teach a two-day shotgun class on Monday and Tuesday, but due to lack of interest, in a separate class the shotgun stuff was folded into the rifle class. I have even less shotgun experience than rifle. The only time I've tried to use one in any sort of tactical scenario at a Polite Society even, I managed to short stroke it twice. So some shotgun training was definitely welcome. Due to the relatively late addition of the shotgun curriculum, only two of the students had brought shotguns. Both were 870s with pistol grips and separate stocks, one mounted an EOTech. We also had a pair of Tactical Response's shotguns, both plain vanilla 870s. I consciously chose to shoot one of the vanilla shotguns. Four guns were enough for all the students to shoot in two relays. John went through the manual of arms, which is somewhat more involved for a pump shotgun than they are for a box magazine fed rifle. Because most 'Tactical' shotguns are really just black fowling pieces, they don't have drop safe manual safeties. Instead of messing around with the trigger block safeties, John advocates carrying the shotgun with a full tube and an empty chamber, then running the slide as part of mounting the gun to the shoulder. Of course, this leads to the question of how to get the gun back to an empty chamber when it's time to sling it. We did quite a bit of dry practice mounting the weapon, clearing the chamber each time before going back to slung. Before handing it off to the next student, we practiced voiding the magazine tube. I found I had to be very conscious of my trigger finger position with the shotgun I was using. I'm used to shooting pistols and rifles with pistol grips, but on the shotgun, that same angle put the trigger finger right next to the trigger guard. I had to raise it quite a bit to get it in the proper register position. Once the dry fire was done, we fired the shotguns at eight and twenty meters to observe the size of the patterns. At twenty, it's certainly getting big enough that the BG might not absorb all the pellets. Our first shotgun drill was one John called 'Rolling Thunder'. Four shooters are lined up facing four steel targets at around 8 meters. The first shooter first at the first target, followed by shooters 2-4 firing at the same target. After the fourth shooter hits the target, the first shooter fires at targets 1 and 2, as do shooters 2-4 in turn. Then each shooter hits targets 1-3, and finally each fire at all four targets. This involves a total of ten rounds, meaning that you'd better be shoving rounds into the tube as fast as you can between shots to avoid running out and having to stand there loading while everyone's waiting. I totally botched this drill the first time out. I had trouble getting the slide all the way forward allowing me to load more rounds into the tube and ended up having to shoot the last four using emergency loads (dumping a shell right into the ejection port and running the slide forward to shoot). I didn't have any trouble getting the slide forward when I needed to fire another shot, so I think the problem was probably that I was anticipating the reload and reaching for a shell before I got the slide all the way forward. The next time through it went a lot more smoothly and I wasn't the source of delay. The other shotgun drill involved transitioning to slugs. After shooting four steel targets with buckshot, we had to rack the slide back, dump out both rounds (the one from the chamber and the one ejected onto the shell lifter when the slide came back) and flip a slug into the ejection port and fire. Then it was time to repeat the process and fire a second slug. I messed up a bit on the first slug, and ran the slide forward a bit causing the shell lifter to pop up. I had to shove it down to get the second shell out and get the slug in there. The shotgun stuff was fun and I definitely learned a lot. I still prefer a rifle for pretty much any application, but pump action shotguns are one of the most popular guns in America and I ought to make sure I can run one if necessary. After we finished with the shotguns, John and Frank made some concluding remarks and the class was officially over. We were invited to watch as the two students who hadn't yet passed the rifle test had another try at it. The entire class stayed around as a cheering section and source of advice. It took a couple of tries, but both students were eventually able to pass. After the tests were over it was time for some fun. I got a chance to shoot a mag through one of Tactical Response's full-auto AKs, which was a real blast. This was the first time I ever had a chance to fire a gun with a 'fun switch' and I enjoyed it immensely. Frank broke out his EOTech equipped FAL and took a couple of shots at a gong about 300 yards away. He was able to ring it pretty easily. John did the same with his XCR. Frank let me have a try with his FAL and I was able to go two for two shooting offhand. I'd pretty much decided to make an XCR in 7.62x39mm my next rifle, but after this I may have to get a FAL instead. Of the post-class activities, shooting the full auto AK was fun, but I have to say ringing the gong with the FAL was a lot more satisfying. Any idiot can hose down a target with a full auto AK, but tagging that gong took at least a little bit of skill. As I said earlier, one of the things I wanted to do in this class was test my gear to see if I needed to change anything in my rifle fighting setup. I was very happy with my XCR. It functioned flawlessly throughout the class and shot far more accurately than I did. I really like the Aimpoint Micro. Going in I was a bit concerned at the small diameter of the tube, but I never had any trouble picking up the dot when shooting off the right shoulder. I'm sure I'll be able to do the same off the left shoulder as well, once I develop a more consistent cheek weld on that side. The Vickers sling worked well, though I hardly used its quick adjust feature, just keeping it at almost the full length for the entire course, so a fairly long fixed two-point sling might have served just as well. I liked having a vertical foregrip on my rifle. A couple of the other students had the short foregrips on their guns, and after shooting their rifles during the pass it on drill, I think the shorter grips worked just as well while contributing a lot less bulk to the rifle. Switching to a shorter grip will probably be the only change I make to the rifle based on my experience in this class. The Sneakybag worked well, save for the time when I grabbed an empty from the dump pouch instead of a full mag from the main compartment. I think this is more of a training issue than a gear issue (more reloading practice necessary). The PMags worked flawlessly. The windows on them were even somewhat useful whether or not they could take a full stripper clip or not, which first actual use I've gotten out of them. I had MagPul tabs on three of them, but I've concluded that they're basically unnecessary with the Sneakybag. Unlike a lot of mag pouches that only expose a small part of the magazine, once your hand is inside the Sneakybag compartment, about half the magazine is available to grab, allowing you to get a full grip on it. They're probably coming off. As I said earlier, one of the reasons I've been looking for good rifle training is because I realized that pistol skills don't transfer to a rifle. However, I think I did a good job keeping my head up and muzzle down, looking around and doing Sul scans, etc. because that's the sort of thing I'm used to doing with a pistol. While gunhandling and shooting skills don't transfer, many fighting skills do. Taking this class has only increased my respect for John Farnam as an instructor. I thought quite highly of him after taking the Fighting With a Handgun class last fall. However, that class involved four fairly advanced students to just ate up anything he could give us. We had a couple of students in this class who really struggled, and John did a great job of bringing them along and getting them through the course without lowering his standards an inch. The way his approach differed for each of these students was instructive as well. One was trying hard, but just wasn't getting the right results. John and Frank gave him a lot of coaching and helpful advice and eventually it paid off. The other student really didn't have the best attitude the first day. He was an AR shooter using one of Tactical Response's guns and blamed his performance on the AK sights. John administered a bit of an attitude adjustment late on the first day and it took. He still struggled, but by confronting the fact that it was him, rather than the rifle, who was at fault he was able to overcome his issues and pass the class. Similarly, Frank Sharpe did an excellent job as John's co-instructor. He did great work coaching students and had some good observations after each drill. This class followed directly on the heels of John's DTI Instructor course, and both he and Frank periodically made some remarks about how to teach these skills to students. This was just a little taste, but it really makes me want to take the instructor course. As far as the content of the course goes, it definitely did a good job covering the basics: shooting, gunhandling, transitions, positions, and support side shooting. If there was one thing I had to criticize about the class, it would be the lack of closer range shooting. Aside from the brain stem shots, virtually all the rifle shooting was done from forty meters. This is probably a pretty good range for teaching the basics, since it's far enough to require people to exercise the fundamentals of sight picture and trigger control and expose flaws in student's techniques without being far enough to make it difficult for students to hit paper so their problems can be diagnosed. Nevertheless, I think that some more variety in range, particularly on the closer end, would have been helpful. I'm planning to take Gabe Suarez's Close Range Rifle Gunfighting class later this year, which should probably satisfy my desires in this area. Finally, I have to give kudos to Tactical Response. They did a great job handling the logistics for the course and have some nice facilities. I was able to talk with James Yeager a bit and he seems like a great guy to train with. More than half the class were previous graduates of some of Tactical Response's other classes. Not only did they have great things to say about the classes they took, they were generally excellent shooters with good gunhandling skills. The fact that Tactical Response turns out folks like these certainly speaks well of their program. I think they'll go on my 'must train with in the future' list. So, am I ready to make a rifle my go-to gun for home defense? Well, no. While I'm a lot more comfortable with my rifle, I still can't run it with the same level of skill and confidence I do my pistol. This class has given me a solid basis to build on, but what I need to do now is go through the same process that brought my pistol skills up to the level where they are now. I need to do a lot of dry fire practice: mounting the gun a few thousand times, doing a few thousand reloads, dropping into a few thousand kneeling and prone positions, transitioning to pistol a few thousand times, doing a few thousand shoulder to should transitions, and then doing all these things a few thousand times from the support side shoulder. After that I need to go to the range and shoot a thousand rounds or so. Then I will really be ready to use a rifle when my life depends on it. Thanks for the report! It was our pleasure having you, and everyone else there, as students. It was a great group and a wonderful time seemed to be had by all! Cool Black Eagle. Miss shooting with you but glad to see you are keeping things moving on the other side of the world. 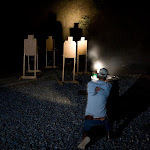 I have taken 3 pistol classes with John Farnam (Basic/Intermediate Pistol, Advanced Pistol and Low Light/Night Shooting) and all have delivered beyond my expectations. I plan on attending his rifle course this year, so thanks for the review!